Anyone who has kept or tried to keep a blog can certainly relate to the feeling of outgrowing the need or desire to have it. With this comes either a willingness to adapt and reinvent your space, or the eventual outcome (whether on purpose or by apathy) to simply abandon it. This is what happened to my first creative space, Luke's Emporium of Senseless Insanity and Wonder. While the name was forcibly complicated, the site itself lasted for over 2 years and served as a place to ramble, and essentially talk about anything off the top of my head. For the most part it was read exclusively by friends and family and was haphazardly written for anyone else who cared to check in. There was no mission statement, no branding, no real design, and very little thought about a target audience. It was a blog worth having to stay in touch; a blog for the sake of having one. Why is this coming up now though? I went to look at the space again after several months, only to discover that Windows Live was now defunct and was giving the option to export the space to Wordpress or to delete the space altogether. While I'll be the first to admit that a lot of the posts are ill-conceived, outdated, and grammatically incorrect, the truth of the matter is that this once important personal blog houses over 150 posts from 2005-2007 during my time in film school. It contains the original promotional posts I used to campaign in the National Film Board of Canada contest for A Chill in the Air. You can also read about my very first film festival at Youngcuts in Toronto or being accepted to Budi2006 in South Korea. Not to mention there are numerous posts about general university/film school frustrations. Everything from student loans to dorm life to summer jobs and textbooks are mentioned. 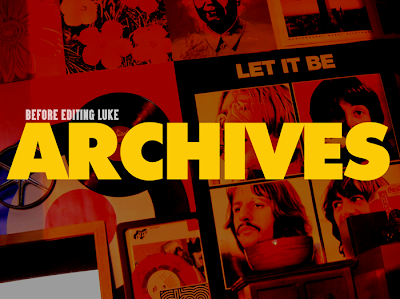 Again, the site was never incredible, but given a few years collecting Internet dust it has developed character when held up to Editing Luke; a site that only exists because I wanted to expand on what the Windows Live space had started out as. Now, after being left abandoned Luke's Emporium has become a time capsule. Something worth preserving strictly for the fact that on some random day I may want to read about how minor some of my past problems seem now, or share some of that student nostalgia, or hopefully, have a barometer for how the things I said I wanted to do back then are becoming more and more of a reality now. You can visit this unpolished space, which for continuity sake has been renamed Before Editing Luke: The Archives by clicking the title link. I wasn't all that invested when I first started blogging, but I'd be lying if I said I didn't appreciate having these posts now. At the very least, it might be proof that I've grown up a bit. Maybe. 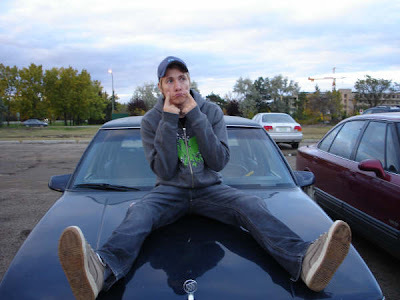 This photo is from September 2006 from a post titled When You're 17 Going on 18, which was in reference to my cars age. After getting back to school 'the Buick' had a serious breakdown and I was forced to realize that she was beginning a slow and painful death. Despite this, the Buick to the Future shorts followed in 2007 which are still some of my favorite memories with this car.